Worn black high top chucks. There was an unforgettable odor to my old Converse. Tenny shoes, we called them. Sneakers was an up-north term yet to surface in my boyhood. I’m talking the tread-bottom dark ages. Mid-century. In my jock corps, the only choice was black Chuck Taylor high tops. Cost maybe $12.95. With those classic Converse, newness didn’t last long. Not in playground dust. Tennys got dirty, then wet. Insoles went squishy. Rubber soon oozed between toes. Mom made me leave my stinking chucks on the back porch. Sneakers hadn’t become style. Dreams were somewhat different then. Curiosities. Imaginations. Nobody in any 1950s town foresaw ESPN or cell phones or multimillionaire shortstops or Microsoft or earrings for boys or microwave cooking or Nike. Goodies did evolve. But, in some vital ways, it was a better time when our choice of sneakers was smelly chucks and not putting on Airs. Life was less complex. Simpler. Safer. Pretty much, only cops toted guns. Among the more ghastly juvenile crimes was pilfering hubcaps. Not killing convenience-store clerks. Kids didn’t get beat up by bullies wanting to steal tennys. Maybe the aroma was a factor. Today, stenches are different. There is debate over the righteousness of college coaches who get base salaries in the $100,000 range but add $100,000 and more if their amateur players wear sneakers and other equipment from Nike, Reebok, Adidas or a modern-but-less-imposing Converse. Biggest by far is Nike, which spends $1-billion a year marketing non-smelly, non-cheap wares. Basketball icon Michael Jordan is the lord of Nike spokesmen, with 22-year-old golf phenom Tiger Woods sneaking up fast. This week, Knight showed up in Washington. Playing defense. He told the National Press Club that he is “proud, not ashamed” of Nike operations, wages and facilities in Korea, Taiwan, China, Singapore, Thailand and Pakistan. Pressure on Nike is appropriate. Jordan and Woods should be held to considerable standards. Knight is making changes, but he must be pushed harder. But shouldn’t we even more considerably fume about odious business practices far closer to home? As we shout on behalf of disadvantaged villagers in countries half a world away, our ire should be even more intense over disgusting methods that perpetuate long-running miseries of migrant farm workers in a not-far-away place called Florida. Uneducated, rootless people living in squalor are paid pitiful wages and cheated of benefits. Because they harvest our fruit and vegetables, rather than sewing prized Jordan/Woods sportswear, these battered and powerless masses merit no less uproar of critical attention than is being aimed at Knight and Nike. 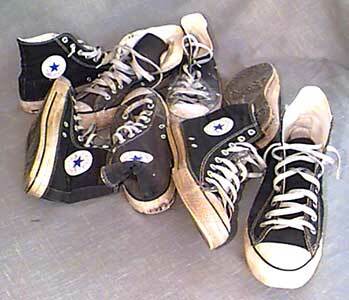 In 1998, it’s not my old Chuck Taylors that are the most disturbing smell.